Black box is a generic term used to describe the computerized flight data recorders carried by modern commercial aircraft. The Flight Data Recorder (FDR) is a miniaturized computer system which tracks a variety of data regarding the flight of the plane, such as airspeed, position, and altitude. This device is typically used in conjunction with a second black box known as the Cockpit Voice Recorder (CVR), which documents radio transmissions and sounds in the cockpit, such as the pilots' voices and engine noises. In the event of a mishap, the information stored in these black boxes can be used to help determine the cause of the accident. Black boxes have been used since the earliest days of aviation. The Wright brothers carried the first flight recorder aloft on one of their initial flights. This crude device registered limited flight data such as duration, speed, and number of engine revolutions. Another early aviation pioneer, Charles Lindbergh, used a somewhat more sophisticated version consisting of a barograph, which marked ink on paper wrapped around a rotating drum. The entire device was contained in a small wooden box the size of an index card holder. Unfortunately, these early prototypes were not sturdily constructed and could not survive a crash. In the 1940s, as commercial aviation grew by leaps and bounds, a series of crashes spurred the Civil Aeronautics Board to take the importance of flight data more seriously. They worked with a number of companies to develop a more reliable way of collecting data. Rising to the challenge, General Electric developed a system called the "selsyns," which consisted of a series of tiny electrodes attached directly to the plane's instruments. These sensors wired information to a recorder in the back of the plane. (Recorders are typically stored in the plane's tail section because it is the most crash-survivable area of the plane.) GE engineers overcame a number of technical challenges in the design of the selsyns. For example, they cleverly recognized that the high altitude conditions of low pressure and temperature would cause the ink typically used in recording devices to freeze or clog the pens. Their solution was a recording system that relied on a stylus to cut an image into black paper coated with white lacquer. However, despite their efforts, the unit was never used in an actual flight. Around the same time, another engineering company, Frederick Flader, developed an early magnetic tape recorder; however, this device was also never used. Black box technology did not advance further until 1951, when professor James J. Ryan joined the mechanical division of General Mills. Ryan was an expert in instrumentation, vibration analysis, and machine design. Attacking the problem of FDRs, Ryan came up with his own VGA Flight Recorder. The "V" stands for Velocity (airspeed); "G" for G forces (vertical acceleration); and "A" is for altitude. The Ryan Recorder was a 10 lb (4.5-kg) device about the size of a bread box with two separate compartments. One section contained the measuring devices (the altimeter, the accelerometer, and the airspeed indicator) and the other contained the recording device, which connected to the three instruments. Ryan's basic compartmentalized design is still used in flight recorders today, although it has undergone numerous improvements. The stylus and lacquer film recording device was replaced by one-quarter-inch (6.4mm) magnetic tape, which was in tum replaced by digital memory chips. The number of variables that recorders can track has also dramatically increased, from three or four parameters to about 300. FDRs can now track such in-flight characteristics as speed, altitude, flap position, auto-pilot mode, even the status of onboard smoke alarms. In the early 1960s, the airline industry added voice recording capability with the Cockpit Voice Recorder (CVR). But perhaps the most significant advance in flight recorder manufacture has been the improvements made in its construction, allowing the units to better withstand the destructive force of a crash. Early models had to withstand only about 100 Gs (100 times the force of gravity), which is loosely equivalent to the force of being dropped from about 10 ft (3 m) off the ground onto a concrete surface. To better simulate actual crash conditions, in 1965 the requirements were increased to 1,000 Gs for five milliseconds and later to 3,400 Gs for 6.5 milliseconds. Today, large commercial aircraft and some smaller commercial, corporate, and private aircraft are required by the FAA to be equipped with a Cockpit Voice Recorder and a Flight Data Recorder. In the event of a crash, the black boxes can be recovered and sent, still sealed, to the National Transportation Safety Board (NSTB) for analysis. The Flight Data Recorder and the Voice Data Recorder (or Cockpit Voice Recorder) are built from similar components. Both include a power supply, a memory unit, electronic controller board, input devices, and a signal beacon. Both FDRs and CVRs run off of a dual voltage power supply (115 VAC or 28 DC) which gives the units the flexibility to be used in a variety of aircraft. The batteries are designed for 30-day continuous operation and have a six-year shelf life. The CSMU is designed to retain 25 hours of digital flight information. The stored information is of very high quality because the unit's state of the art electronics allow it to hold data in an uncompressed form. This board contains the electronic circuitry that acts as switchboard for the incoming data. This port serves as the connection for the input devices from which black boxes obtain all their information about the plane. The FDR interface receives and processes signals from a variety of instruments on board the plane, such as the airspeed indicator, on-board warning alarms, altimeter, etc. The interface employed for the CVR receives and processes signals from a cockpit-area microphone, which is usually mounted somewhere on the overhead instrument panel between the two pilots. The microphone is intended to pick up sounds that may aid investigators in determining the cause of a crash, such as engine noise, stall warnings, landing gear extension and retraction, and other clicks and pops. These sounds can help determine the time at which certain crash-related events occurred. The microphone also relays communications with Air Traffic Control, automated radio weather briefings, and conversation between the pilots and ground or cabin crew. The Flight Data Recorder (FDR) is a miniaturized computer system that tracks a variety of data regarding the flight of the plane, including its airspeed, position, and altitude. The system is housed in a heavy metal container that is built to withstand the stress of a crash. beacon can transmit from depths to 14,000 ft (4,200 m). The key components (the power supply, the interface/controller board, and the memory circuits) are built as separate units and then assembled to form the completed black box. This modular approach allows the components to be easily replaced without disassembly of the entire device. Each of these components has its own special assembly requirements, but primary attention is given to the protecting the memory unit, since it contains the data that will be of interest to investigators. A multi-layered configuration is used to ensure the memory unit's integrated circuits are adequately protected. The outermost layer is the housing, which consists of steel armor plate. Below that is a layer of insulation, followed by a thick slab of paraffin, which forms a thermal block. As the paraffin melts, it absorbs heat and therefore keeps the temperature of the memory core lower. Beneath the paraffin lies the board containing the memory chips. Underneath the memory board is another paraffin thermal block, followed by another layer of insulation. The entire assembly is mounted on a steel plate that serves as an access cover. The assembled Crash Survivable Memory Unit is then bolted onto the front of a heavy metal plate mounting shelf with four large retaining bolts. The power supply is attached just behind the CSMU. The Interface and Control Circuit Board (ICB) is attached by screws to the underside of the mounting shelf. A metal access cover protects the board and provides easy access. 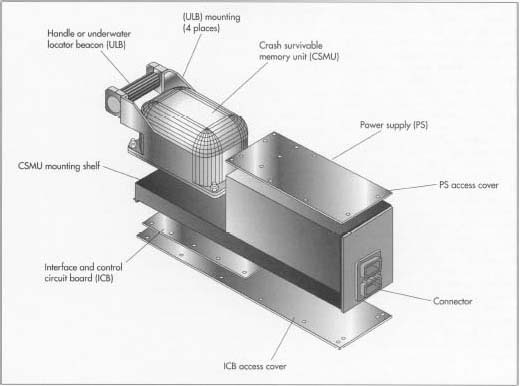 The Underwater Locator Beacon (ULB) is affixed to the two arms extending from the front of the memory unit. The ULB protrudes from the casing and has a cylindrical shape that allows it to be used as a handle for the entire device. If the recorder is to be sold without a ULB, a hollow metal handle tube is installed in its place. The outer casing is painted bright orange or red to make it more visible in a crash. After manufacture, the units are exposed to a series of grueling and somewhat bizarre torture test conditions. Black boxes are shot from cannons, stabbed by thin steel rods, attached to 500 lb (227 kg) weights and dropped from 10 ft (3 m) above the ground, crushed in a vice at 5,000 lb (2,270 kg) of pressure, cooked with a blow torch for an hour at 2,012°F (1,100°C), and submerged under the equivalent of 20,000 ft (6,000 m) of seawater for one month. After such testing, the onboard microprocessor allows a variety of diagnostics to be run to ensure the unit is operating correctly. The high speed interface allows the entire memory unit to be checked in under five minutes. This evaluation can be done at the factory to check that the unit is working perfectly, then again after installation to ensure it is still functioning properly. By regulation, flight recorders for newly manufactured aircraft must accurately monitor at least 28 critical factors, such as time, altitude, airspeed, heading, and aircraft attitude. The average time between failures for these devices should be greater than 15,000 hours, and they are designed to be maintenance free. If the unit passes all of the tests described above, it meets the requirements established by the FAA (Federal Aviation Authority). The future is already unfolding for manufacturers of black boxes. Smith Industries, a major supplier of flight recorders, has recently announced it is developing a single device which will replace separate FDR and CVR units. Their device is known as an Integrated Data Acquisition Recorder (IDAR), and it incorporates flight and voice data in a single box configuration, together with a data transfer system for maintenance data retrieval. The introduction of the IDAR allows a 25% reduction in critical system weight. Interestingly, this new direction in product development comes at the same time as new legislation that makes the recording of data linked to air traffic control messages mandatory. This new law would require black boxes to contain even more information. It is likely that the manufacturers of flight recording equipment will rise to the challenge and develop black boxes that can store more and more information in ever-shrinking packages. AlliedSignal Aerospace Catalog. AlliedSignal, Inc.
Baldwin, Tom. "Black boxes Built to Survive Doom." Journal of Commerce and Commercial, July 29, 1996, p. lB. Goyer, Robert. "The Secrets of Black Boxes." Flying, December 1996, p. 88. Sendzimir, Vanda. "Black Box." American Heritage of Invention & Technology, Fall 1996. Can you tell me the exact specification (the type of battery used, its current and voltage supply etc.) of the power supply that powers the Locator Beacon in case the black box lands in a water body? Just curious here. What a FDR needs is a simplistic ultra durable memory device, an extreme long life battery and a locator beacon. - FDR's typically have an on board circuit boards, audio, interface and processor. These components could be generic and do not need to be enclosed within the unit. The interface to the actual recording device could be a simple serial bus. -Memory. SRAM technology can be made to be virtually indestructible. It is now small enough that multiple copies can be carried. As comparison, the magnetic tape recorders and the modern day ones are still the same approximate size. In the space that a magnetic recorder takes up, several million equivalent SSD devices could be placed giving several thousand times redundancy. So 500 chips get wrecked in the crash. Trivial irrelevant. -Battery. Why one battery or battery pack? Why not multiples, one active, the rest sealed in an equivalent of cryogenic stasis. When the operating one dies, another comes on line. With the newest batteries developed, multiple redundancy is easily possible. -The beacon. Pulsed, say, once per hour, a carrier signal similar to DTMF where it is distinguishable from all background noise, a RF burst and an underwater burst signal. A beacon lasting only 30 days is a joke. Several years should be possible using j-fet ultra high impedance technology.